Home VgamerZ OriginalZ Dragon Age Inquisition: The Inquisition Squad – Who is Who? Dragon Age Inquisition: The Inquisition Squad – Who is Who? BioWare has launched a huge update on Dragon Age Inquisition (DA:I), including a new gameplay trailer and a release date. The video unveils further details regarding Inquisition’s narrative and it also presents all the upcoming companions and some of the supportive characters. Even if most of those characters haven’t been formally announced yet, there is a lot of scattered information that can lead into solid conclusions. Discover the Inquisitor’s followers, as well as their class and possible role in the upcoming story. DEEP AND COMPLICATED CHARACTERS: Lead a party chosen from nine unique, fully-realized characters – each of whom react to your actions and choices differently, forming complex relationships both with you and with each other. This creates a polemic issue that fans have been trying to answer since the release of this information. If there’s only nine companions, then why are there twelve characters in the Inquisitor’s squad? The most obvious answer seems to contemplate the idea that Inquisition will feature supportive characters with very specific and significant roles. And even if they’re not companions, their importance won’t be inferior. Furthermore, BioWare has stated that other supportive characters are joining the Inquisitor’s squad – Morrigan and Alistair are two of them. 2. The Inquisition Squad: Who is Who? This tremendous teasing from BioWare has no other purpose than to build up expectations among players. After all, with so many seemingly unknown characters, it’s natural to wonder who is who. Fortunately, it’s possible to identify most of the characters in the video and that’s mostly because Dragon Age has an impressive fan base. Cullen has always been part of the Dragon Age series and its multiple crisis. Now, he’ll return to help restoring order but possibly as a supportive character. 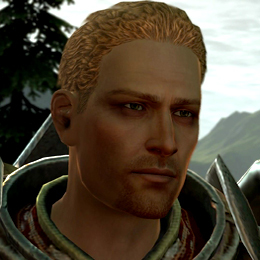 BioWare has confirmed Cullen’s return during PAX East 2014 by assuming that he’lll be one of the possible romance options. However, Cullen appears in this video with a noble costume and no signs of a weapon. A strange detail for someone who has been part of the Templar Order for countless years. I think this can only indicate that Cullen won’t return as a companion. Vivienne is one of the few confirmed companions to date. More than being confirmed, she has received multiple articles in BioWare’s official blog regarding her background story, position and purpose in Inquisition. She is known as the Lady of Iron due to her determined personality and she will join the Inquisition Squad to aid her fellow mages however she can. Despite her rank and status as an Imperial Enchanter, Vivienne doesn’t allow anything or anyone to stand in her way. She’ll serve with righteous and legitimate magic and she might be a possible romance option. The hilarious storyteller dwarf from Dragon Age II will return as a full time companion in Inquisition. Just as Vivienne, he has been announced for a long time too and he surely won’t disappoint. His instinct to get into trouble will serve him well once again, as Varric will find himself entangled in a war that is shaking the entire world. 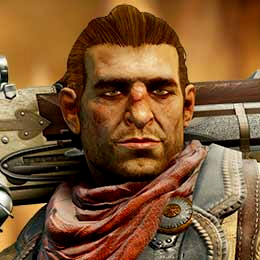 With enemies at every corner, the Inquisitor will surely need a friend like Varric – that guy who is loyal, honest, generous, funny and most of all, he always got your back. Let the adventure begin. 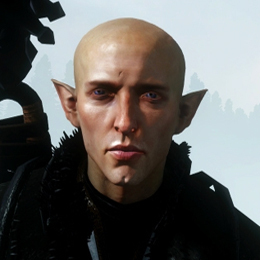 Solas’ identity was leaked last month by the German PC magazine GameStar that branded the character as “Solace”. Later on, BioWare stepped up to correct the magazine’s mistake and ensured that Solas is indeed an upcoming character in Inquisition. Very few is known about this elf mage, other than he’s an expert on the Fade and has knowledge of ancient magic. The great seeker needs no introductions. 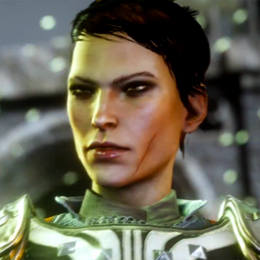 Cassandra has been part of nearly all Inquisition’s trailers and she’s probably the most divulgated companion so far. Cassandra will become the Right Hand of the Divine in the upcoming game and she’ll be one of the multiple romance options, as announced in PAX East 2014. 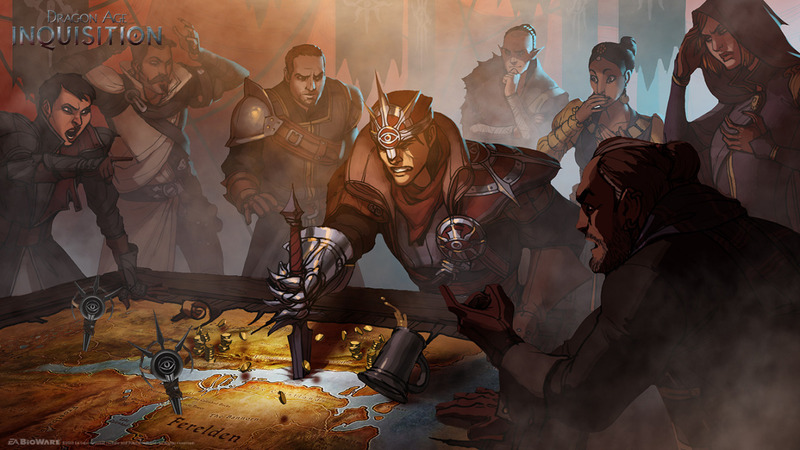 With great power comes great responsability and it seems Cassandra, together with the Inquisitor, will be extremly involved with the political affairs of Thedas. 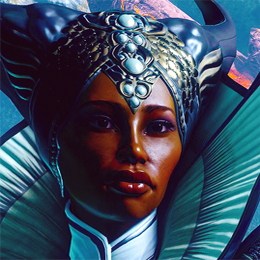 The Inquisition squad will be truly multicultural and as evident, a qunari subject couldn’t be missed. 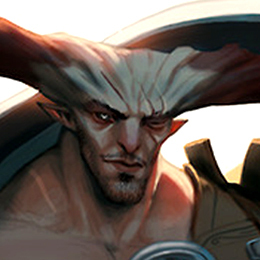 Iron Bull is a male qunari warrior and a confirmed Inquisition companion by Official Xbox Magazine. The rumors started when BioWare’s Lead Concept Artist Matt Rhodes created a concept art featuring this character. Back then, no one really knew who he was or what it meant but now everything’s crystal clear. Iron Bull is a mercenary and he enjoys to be far away from home, that way he can be unfaithful to his religion and kill, drink and steal as he wishes. Dorian Pavus is an underworld character. No one really knows where he comes from but there’s a few details circulating that might be true. Apparently, he’s a magister from the Tevinter Empire but he’s a bit different. Unlike most of his kind, he wishes to free his homeland from slavery and corruption. 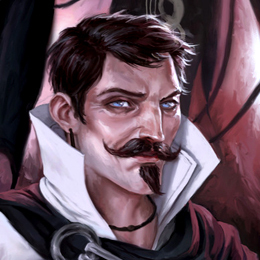 He is a mage and part of his staff can be seen in the squad picture, which indicates he’s a presumed companion. BioWare has recently confirmed that romance options in previous games won’t return as companions. 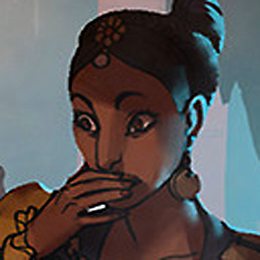 Now, Leliana was a possible female romance in Origins, which means she won’t be a companion in Inquisiton for certain. 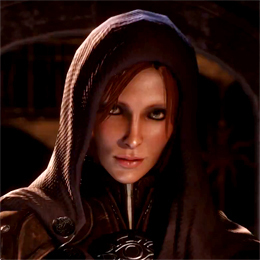 At the end of Dragon Age II, Leliana appeared to be Cassandra’s counselor. Besides that, in this squad picture she is seen without her rogue daggers and with a Chantry’s amulet. Meaning she has become totally devoted to political affairs. 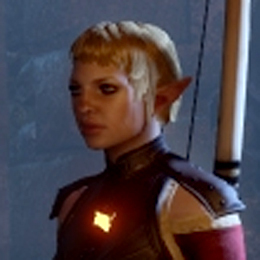 Sera is a female elven archer and a confirmed companion for Dragon Age Inquisition by Official Xbox Magazine. Apparently, she was leaked accidentally and nothing much is known about her. She is a young and frenetic rogue who believes that what you do is more important than where you’re from. The scribe girl has no name yet and nothing is known about her other than she’ll most likely be a supportive character related to intellectual matters, including trades. Her noble and notorious costume indicates that she’s most likely well positioned in society. She has been spotted in official concept art wallpapers before. The information circulating regarding this character is very doubtful and inconclusive. 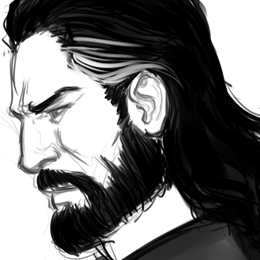 Fans assure that this bearded male human is the Grey Warden Alistair’s mentions during Origins, he’s supposedly a notable Gray warden known for his stunning drinking skills. 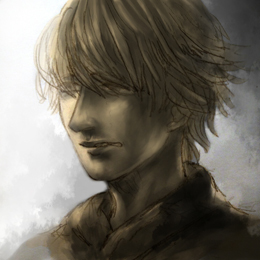 Furthermore, he has been spotted in several concept arts and a pre-alpha gameplay trailer released in 2013.